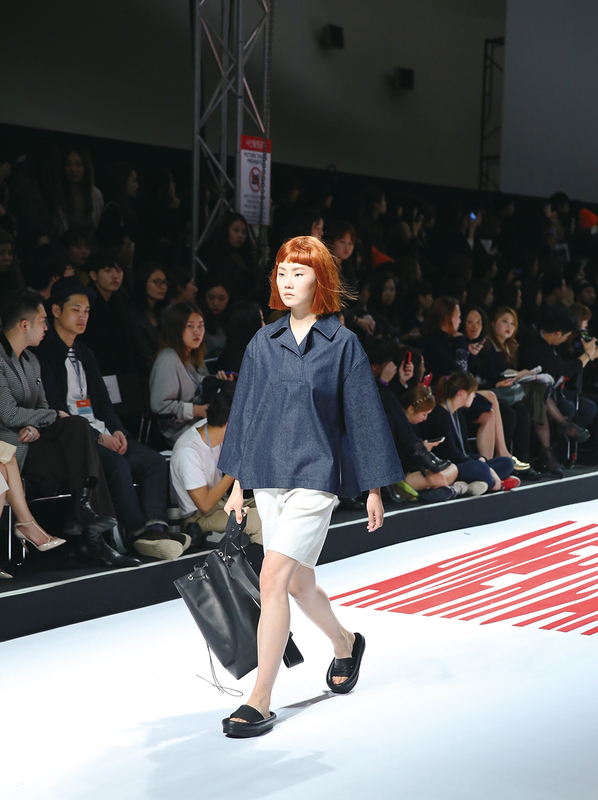 Seoul Fashion week has never had the prestige and lure enjoyed by other major hubs of the industry, but this fledgling status appears to be changing. As this October’s Spring/Summer 2015 designs were being rolled out on the runway, a few special celebrity guests made the festivities all the more elevated. 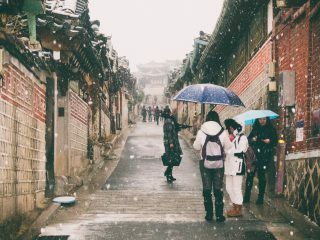 Korean celebrities and idols are no stranger to the front rows, however, the appearance of Anna Dello Russo, Japan Vogue’s Editor at Large and the street style world’s eternal muse; menswear aficionado and Instagram star Nick Wooster; and actress Jessica Alba made for a more heightened experience than usual. 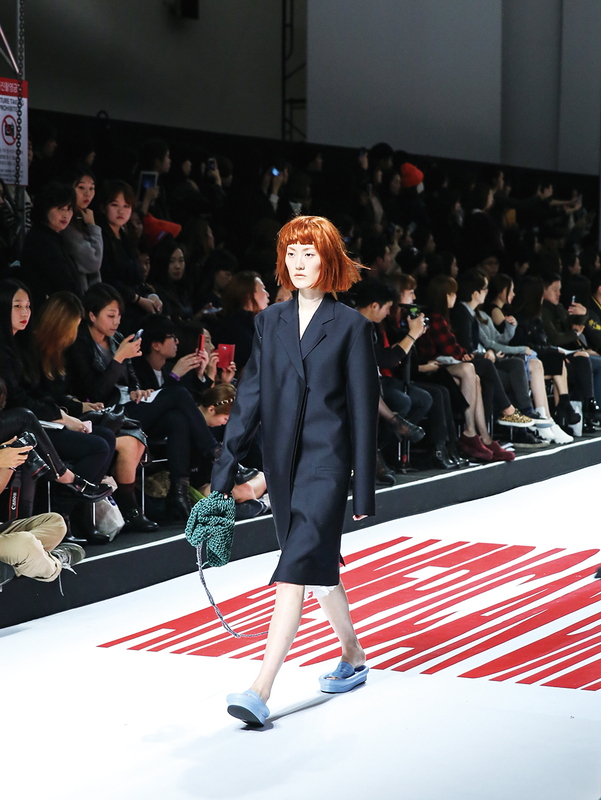 Each flew into Seoul for events loosely related to fashion week or for the shows themselves. 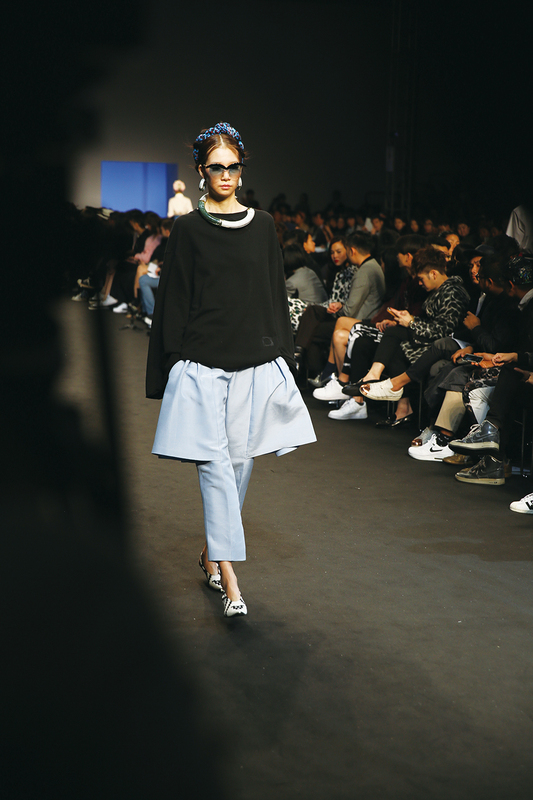 Many have perceived the arrival of scene-savvy audience members as an indicator that the seasonal event may have finally “made it.” But have Seoul Fashion Week and its designers really evolved that much since we last saw them in March 2014? Aside from a few standout creative brands helping to garner intentional attention, I would say no. The plethora of fast fashion quality, incorrect English emblazoned statement pieces and ready-to-wear at your nearest underground subway stall aesthetics still leave some things to be desired. 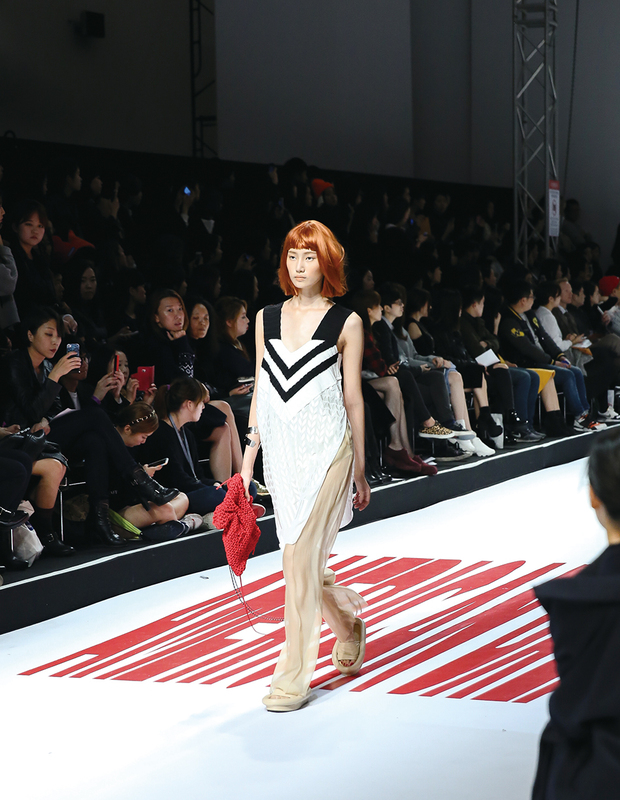 The shows are divided into three categories pertaining to the designer’s experience, however, when all of the shows take place at the same venue that distinction gets lost on overseas press and buyers. 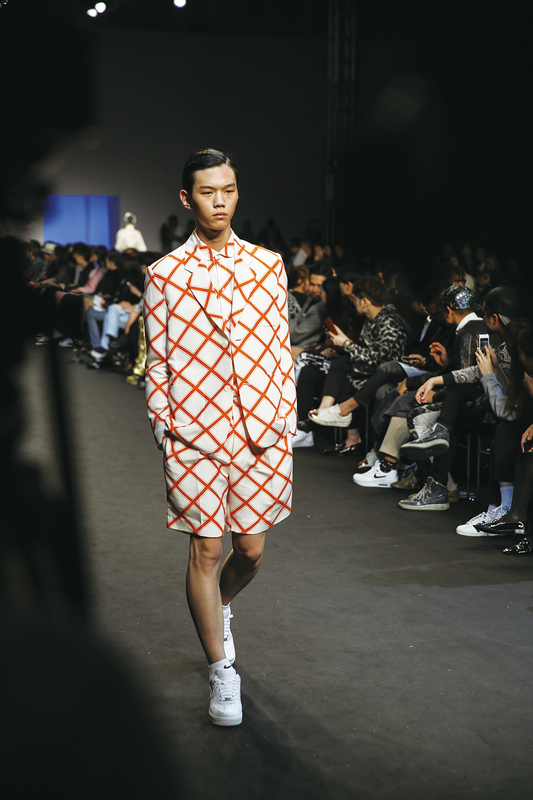 As long as the caliber of talent being shown continues to be quite varied, it may become increasingly difficult to promote Korean fashion to a broader audience. That being said, the designers that do impress and grow with each collection are worth the frenzy of those seven days; each has their own aesthetic that adheres to industry trends yet manages to maintain a distinct identity from everyone else. 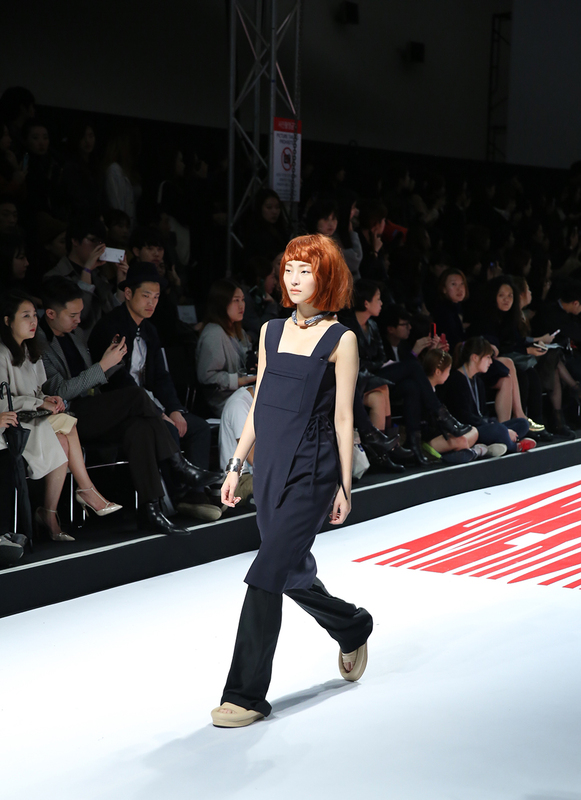 pushBUTTON has been a favorite among the Fa-pe (or Fashion People, a distinctly Korean term) for many seasons now. 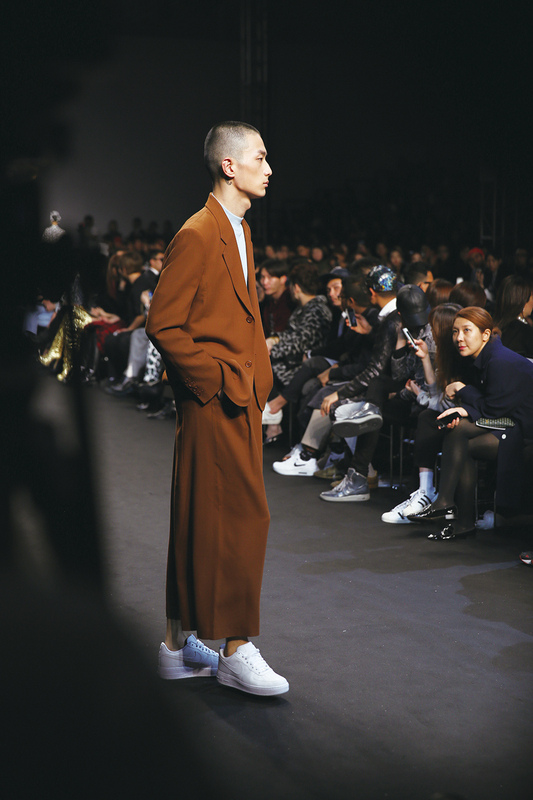 Designer Park Seunggun started the brand in 2003 and has found a niche in transitioning over-the-top colors and patterns into clean and intentional silhouettes with impressive ease. His shows always incorporate an element of fun. This season, pulling inspiration from a single photograph of artist Frida Khalo, Park gave the female models her signature braided crown hairstyle. Less literal references were made through the color scheme and exaggerated proportions, and it would not be a pushBUTTON collection without an element of the unexpected. Revising a design from a previous collection in which dress trains turned into handbags, S/S 2015 saw a sportier version with skirt trains that folder back up to clasp around the waist as a fanny pack. While the athletic wear hints could be seen in many different collections, along with the huge Nike endorsement that resulted in their shoes being used in a number of shows, few were as clever as this. 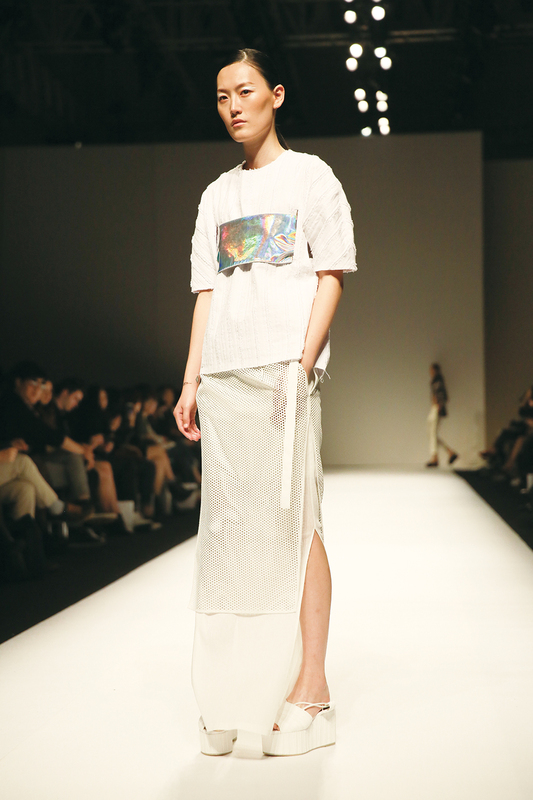 Designer Jehee Sheen has an impressive resume. 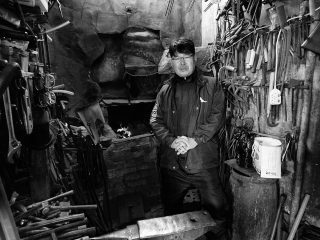 Besides being a professor of art and fashion design at Seoul Art College and having shown his work at numerous international fashion weeks, he is currently the creative director for four clothing lines, including his self-titled menswear brand. 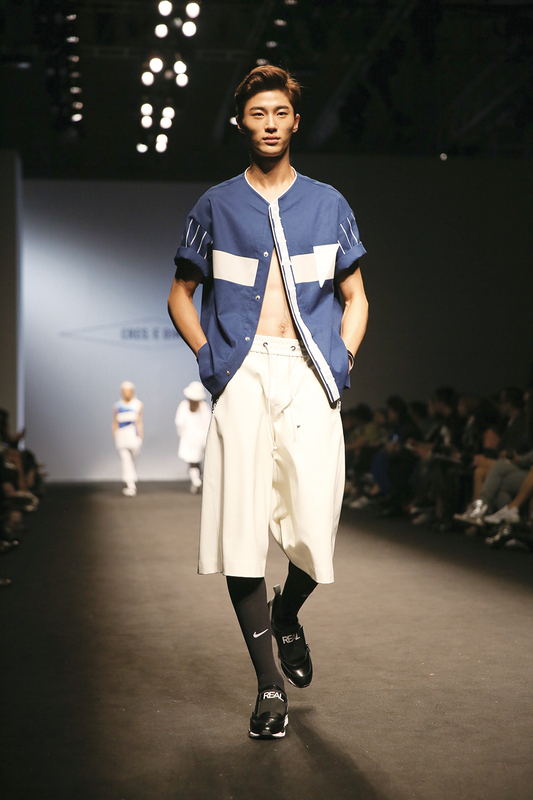 His most recent collection stayed very true to the futuristic minimalism he is known for, with the sparse detailing preventing any distractions from the tailoring and clear, cohesive motif. Digitally printed patterns in white and black with hints of red and blue gave some insight into this season’s subtle nature influence. To see his womens wear lines, be sure to stop by the 32 Dicembre booth on the first floor of the Doota shopping complex (Dongdaemun Station, Line 1). A brand that was started by three friends in 2009, Low Classic quickly outgrew its tiny corner space in Dongdaemun and has become one of the few Korean brands to make it into the overseas market. Creative director Lee Myoungsin has an aesthetic style that is distinctly her own. It is this separation from her Korean peers that has allowed the brand to break into the coveted U.S. market. Low Classic is currently sold by Opening Ceremony online and in their U.S. stores, as well at high-end indie label shops such as Anthom, a retailer with store fronts in Washington, D.C. and New York. This collection’s theme was titled “American Dream: The Complete Worker” and sought to translate the rough-edge, thick-stitch appeal of iconic denim overalls into the feminine minimalist vision the brand values. Skirts and belts resembled large panels of leftover fabric, as if straight off the bolt. The crimson-haired models were adorned with a variety of accessories that adopted the idea of materials made by a single worker’s hands. Chunky knit clutches and heavily corded necklaces were fastened with blocks and tubing that somehow avoided “DIY” territory. It would be difficult not to mention the hard-to-miss leather bumper slides that resembled an American toy of the ‘90s called “Moon Shoes,” and even harder to deny that I want a pair in at least two colors. 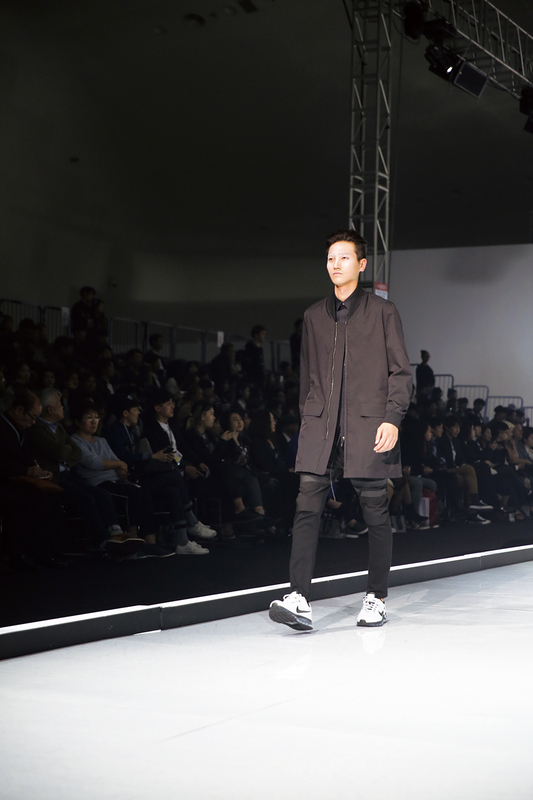 Lastly, an impressive feature of this show was that the look book for the collection was shot live by photographer Kim Jinyoung as the models made their initial appearance on the runway. Faced with the challenge of only having a few moments to capture a good shot, the results are really compelling. 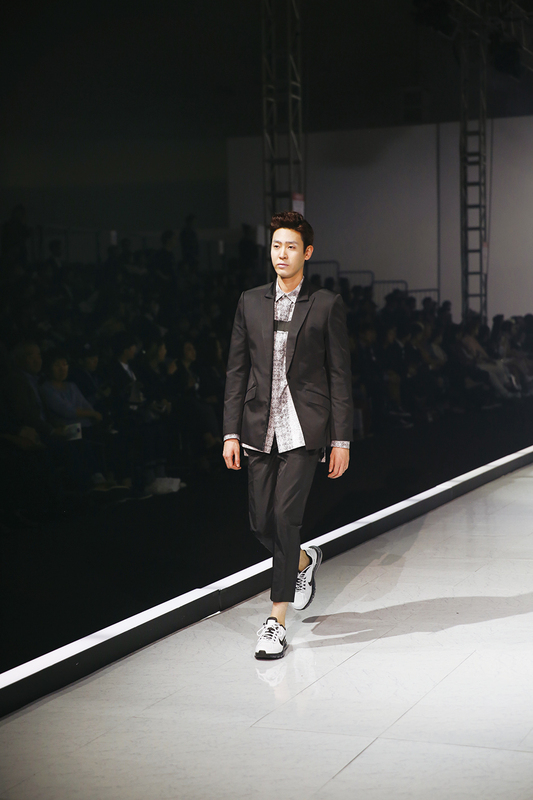 Seoul Fashion week came and went with a frenzy that can only be described as…bewildering. In all of the commotion there were some reoccurring themes that were hard to ignore. Trends dictate the momentum that comes with each new retail calendar season, so let’s just embrace it and get excited for all of these new wardrobe staples. Plunging Vs were seen on the front and back of garments this season. Point taken. The normcore wave has not ended just yet. 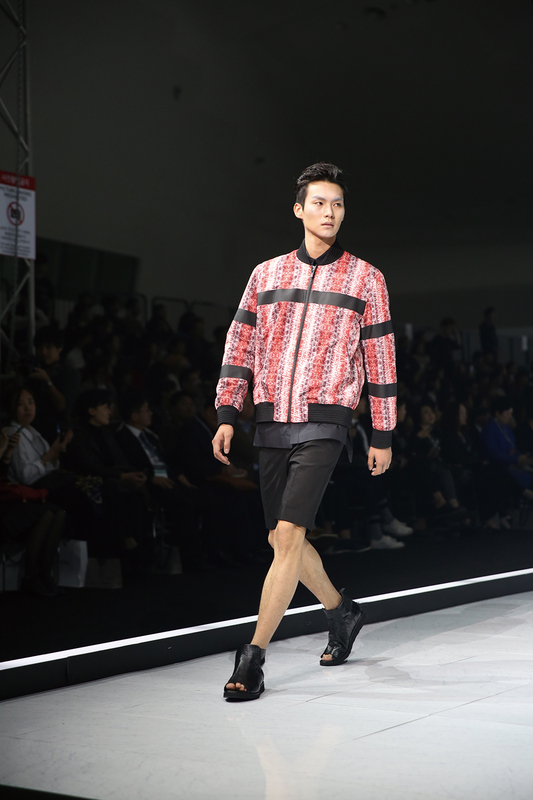 With the athletic wear collaboration between Alexander Wang and H&M causing Seoul residents to camp outside the store two days in advance of its release in the middle of fall, it is no shock that seemingly utilitarian footwear has remained popular. Swatches of fabric seemed to be in abundance at fashion week. Many designers were afraid of being wasteful and found ingenious places to add hanging tags of fabric as embellishments. Similarly, wide belts were tied around the waist sans buckle, keeping with the undone look.